36. Amy May Brown. Daughter of Charles Lister Brown & Sarah Ann Jane Dibble "Annie" Patterson. Born 22 Jun 1898 in Harvey. Died 26 Jun 1984 in Harvey Community Hospital. Buried in Harvey Settlement Cemetery. Amy and Russell lived on the former Robert Thompson farm in Harvey, and Russell also worked on the railroad in McAdam. The had three children: Floyd Granville, Aubrey Russell and Clarice June. 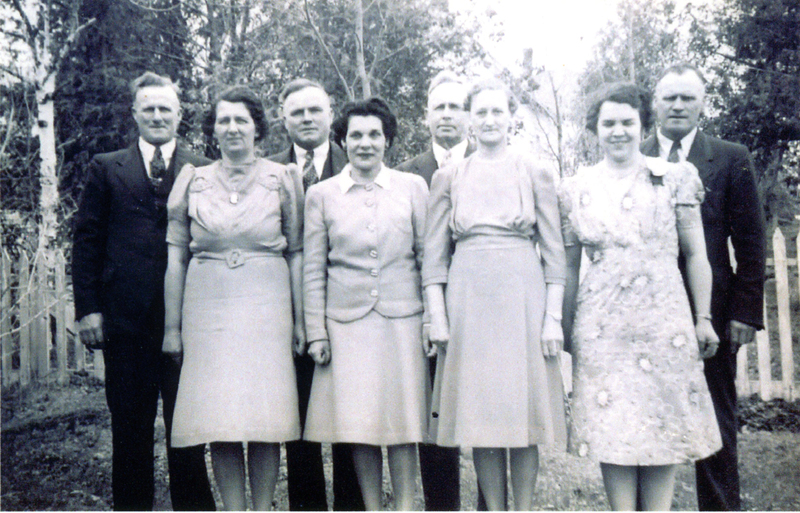 Undated informal portrait of the sons of Tom Moffitt and Mary Ann Whiteman with their wives. Source: Aubrey Moffitt, McAdam, NB. Reproduction scanned by Tim Patterson, 22 Mar 2009. The funeral of Amy May Moffitt was held from the Knox Presbyaterian Church with Rev. David Dewar officiating. Born in Harvey Station in 1898, she was the daughter of the late Charles and Annie (Patterson) Brown. 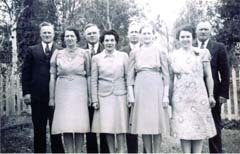 Mrs Moffitt is survived by her husband Russell T. Moffitt and sons Floyd and Aubrey of McAdam, one daughter Mrs Manley Briggs (Clarice) of Saint John, six grandchildren, three great grandchildren, several nieces and nephews. Mrs Moffitt was a member of the Knox Presbyterian Church. She was a member of the Ladies Missionary Society. Pallbearers were Dr. C. B. Brown, Glenwood Patterson, Earle Patterson, Wayne MacLean, Murray Moffitt and Emerson Grieve. Interment took place in Harvey Community Cemetery. She married Thomas "Russell" Moffitt, son of Thomas Moffitt & Mary Ann Wightman, 12 Sep 1923. Born 20 Jan 1899 in Harvey. Died 20 Jun 1988 in MacLean Memorial Hospital, McAdam. Buried in Harvey Settlement Cemetery. Occupation Railroad And Farmer. Religion Presbyterian. MOFFITT: At MacLean Memorial Hospital, McAdam, on Monday, June 20, 1988, Russell Moffitt of Wauklehegan Manor, formerly of Harvey Station. Survived by two sons, one daughter, six grandchildren, six great grandchildren, one brother. Resting at Swan Funeral Home, Harvey until Thursday when prayers will be said at 2 pm, followed by funeral service in Knox Presbyterian Church at 2:30 pm, Reverend David Dewar officiating. Interment in Harvey Community Cemetery. Visiting hours Tuesday 7-9 pm, Wednesday 2-4 and 7-9 pm. The funeral of T. Russell Moffitt, 89, was held from the Knox Presbyterian Church of which he was an elder for many years. Rev. David Dewar officiated. Born in Harvey Station, he was the son of Thomas Moffitt and Mary Ann (Whitman) (sic) all of Harvey. He is survived by two sons Floyd and Aubrey of McAdam; one daughter Clarice of Saint John; six grandchildren and six great grandchildren; one brother Roy of Harvey. He was predeceased by his wife Amy (Brown) Moffitt in 1984. Interment in the Harvey Cemetery. Honorary pallbearers were carmen from Blair Lodge 242, of which Mr Moffitt was a member. Acting pallbearers were Millard Moffitt, Dr. Claude Brown, Emerson Grieve, Wayne McLean, Murray Moffitt and Earle Patterson. 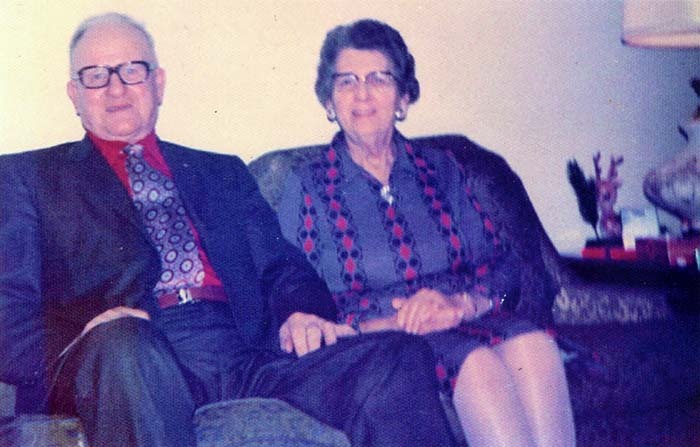 Mr Moffitt was a life long resident of Harvey until the last year and a half when, due to failing health, he was a resident of Wauklehegan Manor in McAdam.